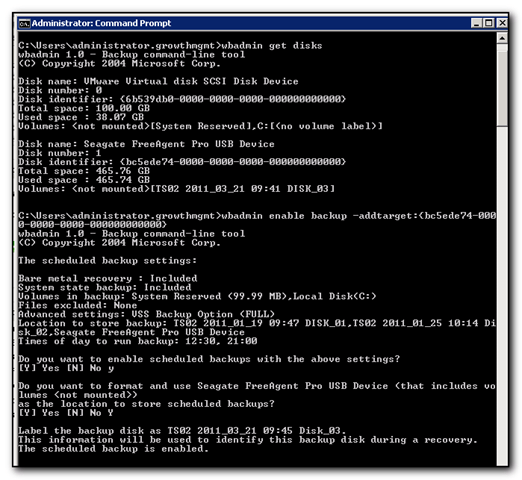 When trying to run LiveUpdate from within BackupExec v12 running on Windows 2008 you may get the error message “To receive updates, Backup Exec must be registered with LiveUpdate. To automatically register now, Click Yes. If you choose not to register now, you will be prompted again when you click LiveUpdate.” The solution is to right click the BackupExec icon and run as Administrator. LiveUpdate will work. I didn’t know that you can only eject an ultrium tape drive when it is completely rewound. Detailed instructions from HP on removing an Ultrium drive are provided. Our Dell technician didn’t know this and we were given the ability to remove the tape *any* way we liked when a tape was stuck in a drive that was replaced. Now I’d like to know if this would have solved the problem…. One of our clients has been having issues with Volume Shadow Copy and SQL (MSDE) causing the backup to fail with the error 0x800423f4. By following the script at TazNetworks it looks like the backup might work tonight. It’s too early to tell but at least when I kicked the job off briefly it started to some work rather than just quit out of ntbackup. We’re back! My site was closed sometime last week as the server it was hosted on was having resource issues. I was offered a move to a new server and unfortunately the flat web pages got moved across but the sql database backend didn’t. It’s now been fixed and we’re live again. Expect a couple of posts from me as I catch up on my blogging from the past couple of days. Now I’m off to ensure I have a REALLY good sql backup of my data – for some reason my control panel backup didn’t include a valid copy of my mysql databases. Discovered today (after a lot of hassles) that Backup Exec may have a problem where backups to a disk folder does not work and ends up in a queued status. Eventually discovered that if you drag the “backup to disk” media to the scratch media pool then the backups start working again. Didn’t find anything on the veritas/symantec web site about this and nothing in google either so hopefully this will help other people out.